KAMPALA – A total of 31 prison warders and wardresses have been affected in the huge shake-up by the Prison Service. According to the February 1 service orders, the Commissioner General of Prisons, Dr Johnson Byabashaija, has since transferred some of the officers, appointed some and sent others on leave. According to the statement, Mr. Kenneth Mugabirwe, ACP, from leave is transferred to Prisons Headquarters ACP staff Welfare. He reports to Director Administration. Mr. Henry Natwaluma, SSP, Ag. Regional Prisons Commander Mid-western is confirmed as RPC Mid-western. He hands over the station to Ms. Annah Kyatuhaire, SP, Officer in charge Kigumba Prison who has been appointed Officer in charge Masindi Main Prison. Mr. Christopher Okware, SSP, DPC Mityana is appointed Regional Prisons Commander Southern region and he takes over from Mr. Allan John Mushabe, SSP, who proceeds on accumulated leave. Mr. Godfrey Obbo, from, leave is appointed DPC Mityana while Mr. Mike Seruyange Kanyike, SP, Officer in charge Kijjumba Prison is appointed DPC Mpigi and he takes over from Mr. Vahid Aoru, who is transferred to Bugiri as DPC. Others affected include; Ms. Regina Nassimbwa, SP, DPC Nakaseke has been appointed officer in charge of Nakifuma Prison, replacing Mr. Godfrey Kalumba who proceeds on accumulated leave. Mr. Godfrey Walakira, SP, Officer in charge Mpigi proceeds on accumulated leave and he has been replaced by Mr. Nehemiah Jurua Adriko Uganda Prison Upper as an officer in charge. Mr. Samary Asindu, Kitalya Prison was appointed the officer in charge of Kigumba Prison. Mr. Gerald Kubomu, Gulu Prison was appointed Officer in charge Nebbi Prison and he takes over from Mr. Alfred Okello POII who is transferred to Uganda Prison Nyimbwa as the officer in charge. Mr. William Kigundu, the officer in charge of Nyimbwa Prison proceeds on accumulated leave. Mr. Edward Muwatwa, ASP, Uganda Prison Farm Mubuku is appointed the officer in charge of Uganda Prison Farm Kijjumba. Mr. James K Nakhosi, Farm Ruimi Prison is appointed Officer in charge Bugungu Y Prison and he takes over from Mr. Francis Xavier Elubu, SP, who proceeds on accumulated leave. Mr. Peter Lwaka, Masindi Prison is appointed Officer in charge of Lamwo Prison. He takes over from Mr. Thomas Tikason Olwoch, who proceeds on accumulated leave. Mr. Daisy Atimango, Masindi Prison was appointed OC UG Prison Lugazi w.e.f 24 January, 2019. She took over from Ms. Harriet Namakoye, SP, who proceeded on leave pending disciplinary action. Mr. Brian Eyagu, Ntungamo Prison from leave is transferred to UG Prison Fortpotal Main for duty. 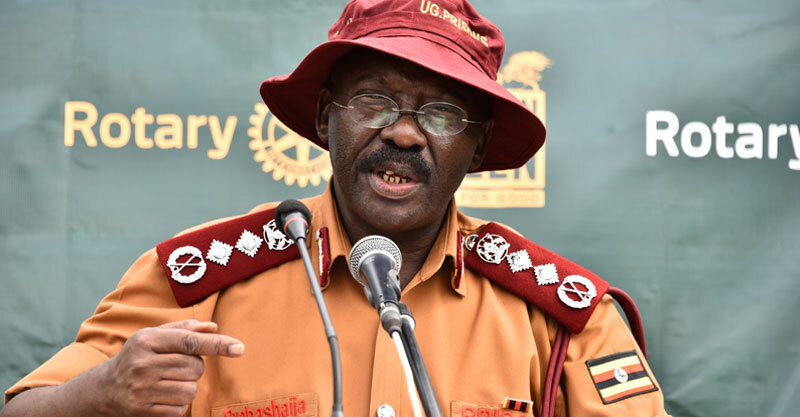 Mr. Kenneth A Byekwaso, has been confirmed Nyabuhikye Prison officer in charge while Ms. Phionah Nassali, has also been confirmed Officer in charge Fortpotal Women Prison. Mr. Samuel Kabitania, POI, Ag. OC Uganda Prison Kabula is confirmed as OC while Mr. Peter Nyangabyaki, POII OC UG Prison lake Katwe is confirmed as OC. Mr. Alfred Odeke, Agule Prison from leave is transferred to Amuria for duty. Mr. Jonn Bosco Ameny, Lira Prison from leave is transferred to UG Prison Alebtong for duty. Mr. Micheal John Okwatum , POII UG Prison Amuria is appointed OC, Ngora Prison. He takes over from Isaac Ekaketi Aoru who proceeds on accumulated leave. Mr. Richard Nyadru, Kijjumba Prison is appointed OC UG Prison Bamunanika and he takes over from Mr. Charles Drali Kamungu, who proceeds on accumulated leave while Mr. Aggrey Ahimbisibwe, of Murchison Bay Prison, is appointed officer in charge Kagoma Prison. He takes over from Mr. Ivan Niwamanya, who proceeds on accumulated leave. Mr. Calvin Tweny, Mbale Prison from leave is transferred to Dokolo Prison for duty. Mr. Gilbert Opentho, Farm Lugore Prison was appointed in charge n Farm Lotuturu Prison and he takes over from Gautama Candano, who recently retired from service. Dr Byabashaija has also replaced officer were recently sent on forced leaves pending disciplinary actions. Mr. George Vuciri, Farm Muinaina Prison is appointed in charge Kangulumira Prison, replacing Ms. Grace Nalule, ASP, who proceeds on leave pending disciplinary action while Mr. Raymond Obala, Prison Farm Kitalya prison was appointed Muduma Prison in charge replacing Mr. Moses Oven, who also proceeds on leave pending disciplinary action. Dr Byabashaija has also transferred Mr. Denis Ongwech, Kigo Prison who was on leave to Lugazi Prison for duty while Mr. Simon Ochelem, has been transferred from Kigo Prison to Farm Kijjumba Prison for duty. Mr. Norbert James Wokorach, has been moved Farm Muinaina prison to Farm Kijjumba prison for duty. Dr Byabashaija said that the transfers take immediate effect unless otherwise stated. “All those sent on leave must strictly be taken outside the institutions. The Director of Administration to facilitate execution of these orders without delay,” he said. Dr Byabashaija described the changes as rejuvenation and rewarding of performance and training.